That was the message as the Wiz Happy Hour bar crawl train moved down the streets of Chinatown. 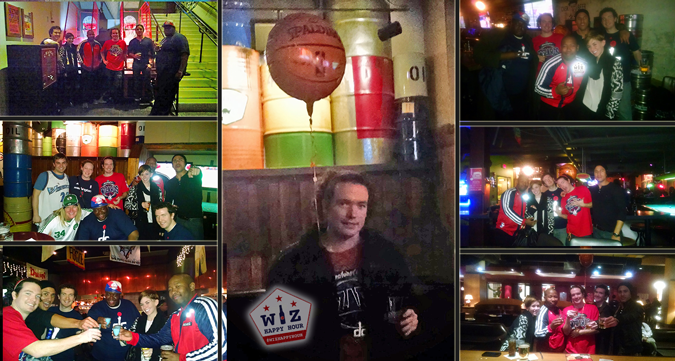 With an NBA basketball balloon tied to my back (like an idiot) we strolled down 7th street chanting "Let's Go Wizards! ", inviting anyone nearby with Wizards gear on to hop on the train. 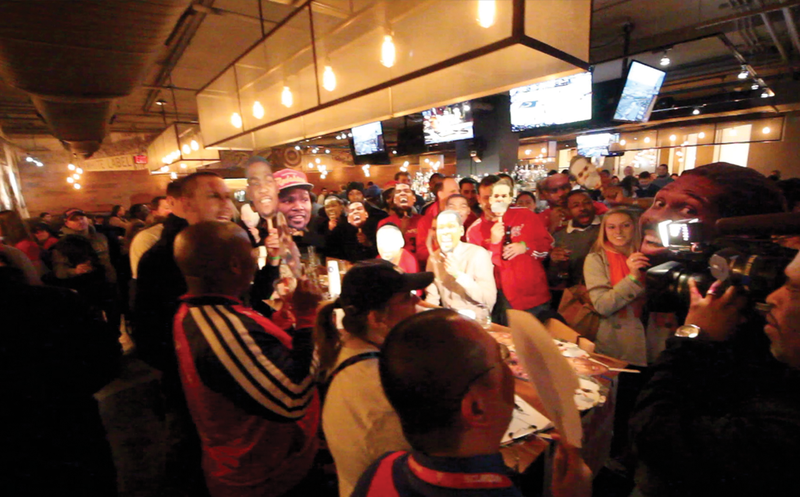 The Washington Wizards hosted a poorly run bar crawl for the 2nd time of the season. Attendance appeared to be low and bartenders at all 6 stops along the way mentioned that they had very few Wizards fans show up. 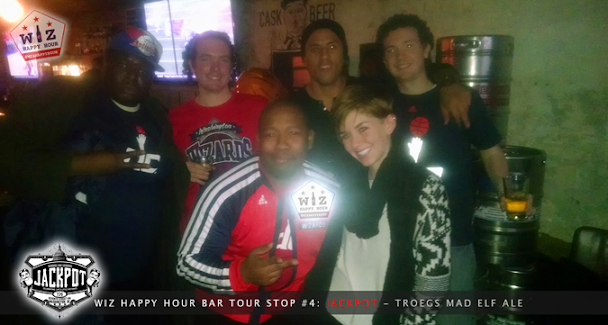 However, where the team failed the Wiz Happy Hour Crew made up for it as we visited each of the 6 stops along the way spreading the Wizards cheer all over Chinatown (Photos). 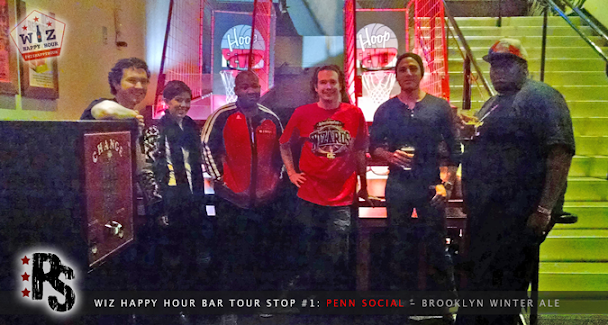 We started our crawl at Penn Social. They have a happy hour that runs every day of the week so all beers were $2 off, even on Saturday, perfect for our signature Brooklyn Winter Ale drink. We needed some food in our stomachs for the long journey ahead so we got the Uptown Nachos which were covered in chili, cheese, guacamole, sour creme, jalapenos, and pico de gallo ($12). We enjoyed a few drinks at the bar, rocked out to the classic rock on the jukebox, and had a basketball shooting contest where the loser was required to buy everyone else a shot. Soon most people had arrived and it was time to move along. The signature drink for this stop was the Brooklyn Winter Ale, a scotch ale out of Brooklyn Brewery in New York ($5 at happy hour). 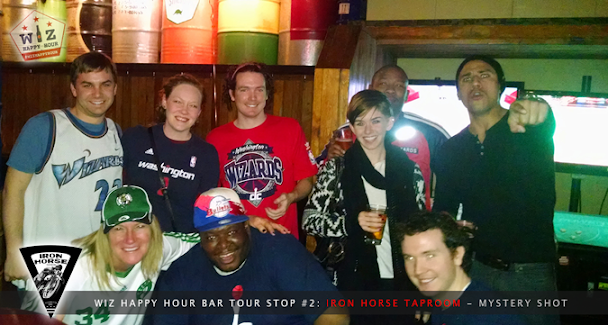 The next stop on the tour was the Iron Horse Taproom. The bouncer at the door thought my sweatshirt was a Yuengling bottle (WTF) so we were already off to a great start. There was a sign on the wall mentioning a "mystery shot" so we decided to make this our first group shot. It was pretty terrible but as they used to say a long long long time ago, YOLO! Ew makes me sick to type that. The bar was just about empty, but we picked up about 7 new people to join our crawl and engage in some bar / basketball / life talk. We even let a Celtics fan in on the action. BOOO!!! Well a few more drink in the 30 minutes allotted and it was on to the next one. Follow the balloon! The signature drink for this stop was the Mystery Shot, which on this day was something that tasted like fruit and was reddish pink. ($5 all times). 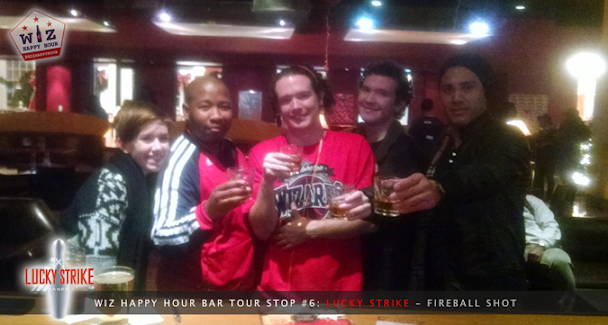 Next was quite a walk (like 3 blocks, lol) to RFD the official check in bar of the Wizards Bar Tour. As expected the check in table was hidden and the guy running it was basically just napping. We even walked next to the table and someone yelled "Don't get a wrist band, beer is $3 anyways". 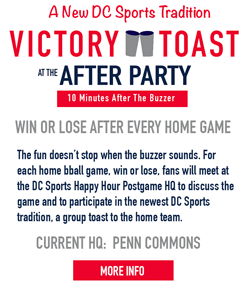 This is something we've known and another reason Wizards Bar Tours are poorly run and not attended well. RFD random drink happy hour ends at 5pm on weekends but they have $3 Bud Light 16oz Aluminums (Possibly at all times). But as one bar goer stated "You don't go to RFD for bud light". True. 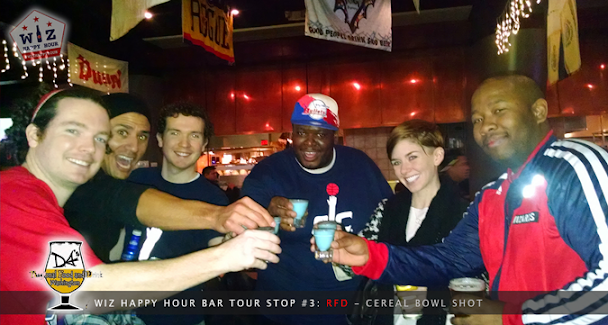 You also don't go to RFD for a cereal bowl shot, but somehow that happened. If you don't know what a cereal bowl shot is it is basically old milk mixed with liquor or something. Terrible! After another few drinks here it was time to move on to the next spot. We were halfway done our bar crawl and halfway in the bag as we walked down to the hidden dungeon that is Jackpot. Jackpot is a chill spot and also has a $2 off beer happy hour that runs on weekends as well (til 8pm). We took advantage of this with some beer out of Hershey, PA, the Troegs Mad Elf. Warm & toasty! The group noshed on the free popcorn and begged me to slow the train down, but there is no rest for the weary! On to the next! The signature drink was the Troegs Mad Elf, a Belgian Strong Dark Ale brewed by Troegs Brewing Company out of Hershey, PA. ($6 at Happy Hour). 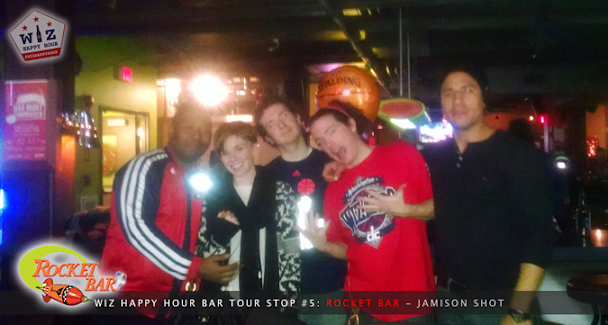 Next up was another basement bar, rocket bar. This was the spot where I asked the bartender how many Wizards fans showed up and she screamed with emotion "Not a single one!". Rocket Bar is where things begin to get blurry, which wasn't helped by the shot of Jamison we took. I'm pretty sure things happened and discussions were had and I yelled at everyone telling them it was time to move on! The final stop on the tour before the game was Lucky Strike bowling alley / bar / lounge / whatever for a final shot before we headed into the game. Only 5 remained but all 5 of us made all 5 stops! For some reason Lucky Strike is always included on these bar crawls and every time there is not a single person at the bar. That's why our time here was 4 minutes. In and out! 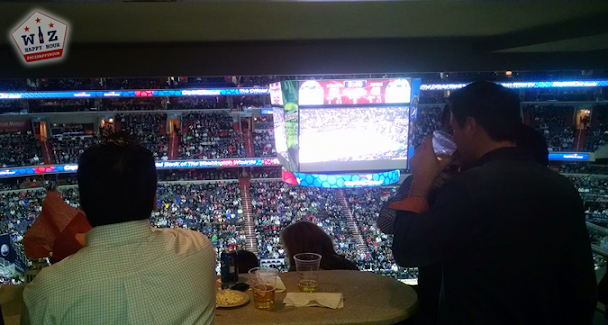 Somehow after the bar crawl was over, a few of us ended up in a luxury suite enjoying free food and some free Budweiser cans. I don't know what suite it was, who let us in, or how we got there, but we did it. And we think we watched the Wizards win, but I'll have to recheck the box score. Overall, the awesome group of people we assembled (and the many people who joined us here and there) made this bar crawl event a huge success. I had no confidence we would make it through all 6 bars but somehow and some way we did it! Just like the Wizards we stuck to our plan, utilized our combination of veterans and youth, and fought til the very end. We're going to the bar playoffs baby!!! And if anyone from the Wizards is reading this and wants people to attend their events, give me a call. I'm available for a price.